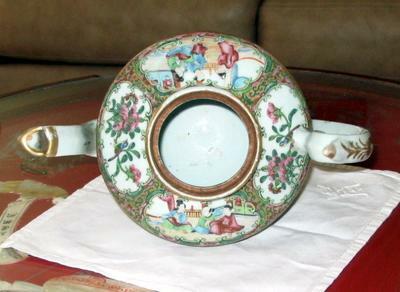 Gorgeous fine painting, gilding and enameling on a very rare example of Chinese Rose Medallion porcelain...the handle defines the age of the pot. is it really old or fairly new? 1)I have not bought it yet and I have my doubt about its age. I requested more pictures from the seller but he is not getting back to me. Is the third picture the bottom? I took that to be the inside of the lid. If that is the bottom, further pictures would be warranted. 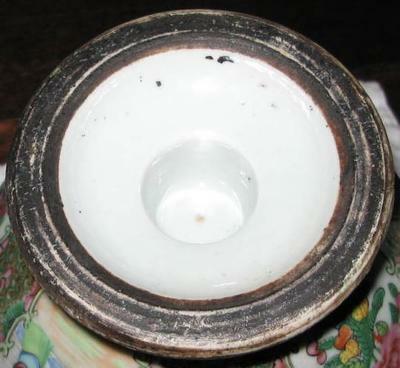 I would also like to mention the possibility that the lid might be not original, or was restored. Check if the gilt is the same hue as that on the body. And, as Stan says, I would try to wash it. There is no reason that the dark dirt could not be washed off if it is authentic. 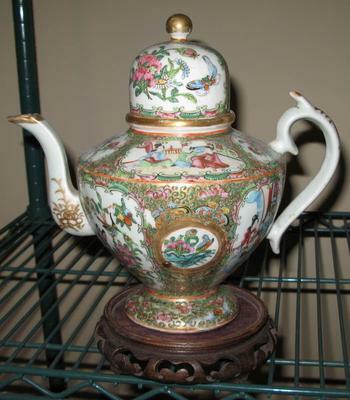 all the older Rose Medallion Tea pots that I have seen have some ware, this tea pot dose not... 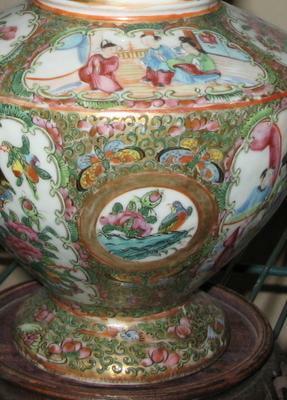 The gold for example on the lid, none of the gold has rubbed of and the rest of it looks the same, the dirt on the bottom looks like it was applied to give the appearance of age, see if you can was the dirt off, the shape and style look older but the painting looks new to me. Is the surface smooth or rough and uneven because of thick enamel? I cannot see that without closeup pictures. If it is the latter, then it should be late Qing dynasty.